There’s something refreshing about manual work - the type to get your sleeves rolled up, your ego going and your in-laws’ favourite carpet stained. Oops. More than just a thrill for your free time, manual work is the occasion to challenge your hands and your hustle. But whether it’s earth in the garden, potions in the kitchen or grease in the garage, your craft is bound to make a mess. Hereon out, it doesn’t have to. Risdon & Risdon bridges two generations of creativity, design and craftsmanship in a charming family-run business. Based in Shropshire, a British artisanal hub, it’s no surprise the brand found the inspiration to perfect the most understated work companion of them all: the apron. Dating back to a time craftsmanship when was queen, the apron is a testament to the stained, smeared streaks of hard work. 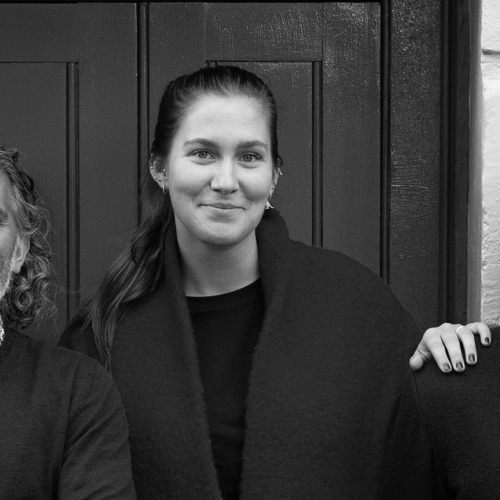 The British company is composed of a “mother and sons” team; Carla has a background in textiles, Alex masters the art of leather working and James specialises in all things creative within the company. Meticulous and passionate, the trio aims to create a premium product in the best possible conditions.